Presented by Earshot Jazz & Nonsequitur, with support from the Berlin Senate Cultural Affairs Dept. and Goethe Institute. German multi-reed virtuoso Gebhard Ullmann is considered one of the leading personalities in today’s Berlin and international music scenes. The recipient of numerous awards, he has recorded close to 40 CDs as a leader/co-leader for labels such as Black Saint/Soul Note, Leo, Between the Lines, 482 Music, Songlines, CIMP, Drimala, Nottwo, and Clean Feed. 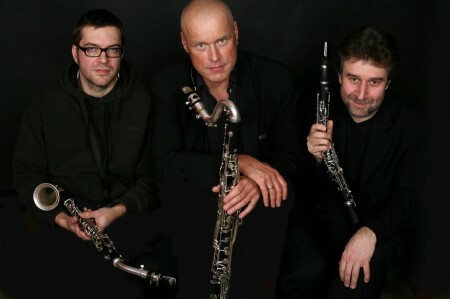 His Clarinet Trio with Jurgen Kupke and Michael Thieke encompasses Ullmann’s many interests. Employing minimalistic techniques, overtones, multiphonics, and other techniques give the impression of more than three players, enabling the ensemble to move beyond the limitations of the source material. J.A. Deane (Dino) is a multi-instrumentalist who performed with John Zorn on his pioneering 1985 Cobra, has been a long-time member of atmospheric trumpeter Jon Hassell’s group, and has worked extensively in Butch Morris’ ongoing Conductions projects, adapting Morris’ improvised conducting technique to his own Out of Context ensemble in New Mexico since 1997. Long known as a trombonist and bass flutist, he now specializes in real-time electronics. For this concert, he plays a custom-made lap steel/dulcimer/guqin, layering melodic cells, prickly harmonics, and lush, bowed backgrounds through his assortment of electronics and live samplers.